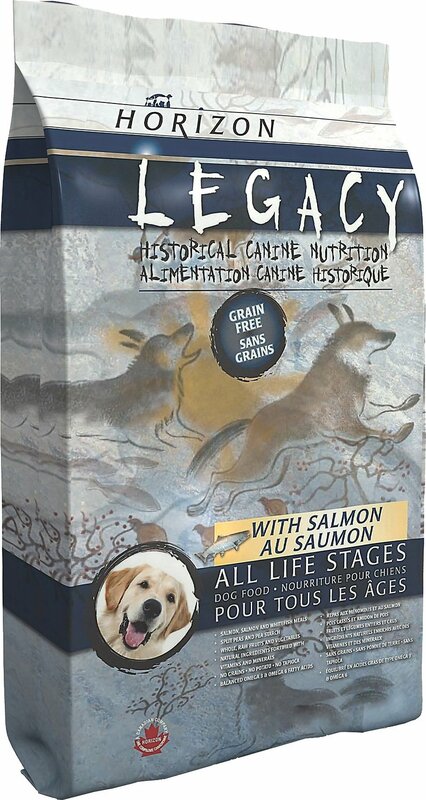 Give your pup a whole, complete meal true to her instincts with Horizon Legacy with Salmon All Life Stages Grain-Free Dry Dog Food. This healthful food is an innovative grain-free pet food that applies the same nutritional philosophies of a raw diet but in a convenient super-premium kibble. 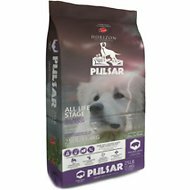 This ancestral diet, grounded in a historical understanding of your pet's nutritional needs, contains an abundance of fresh, wholesome meats combined with fruits, vegetables, unique botanicals and supplements all designed for immune health. Wholesome health is on the horizon! Innovative grain-free pet food applies the same nutritional philosophies of a raw diet, but in a convenient kibble. Meets the needs of your pup's ancestors with an 80% inclusion rate of high quality salmon and salmon meal. Packed with powerful antioxidant properties that shield your pet from free radicals and help fend off disease. Glucosamine and chondroitin are included for a superior combination of joint health supplements in a balanced formula. Naturally sourced prebiotics, mannan oligosaccharides (MOS) and fructo-oligosaccharides (FOS) have been added to stimulate intestinal health and overall immunity. 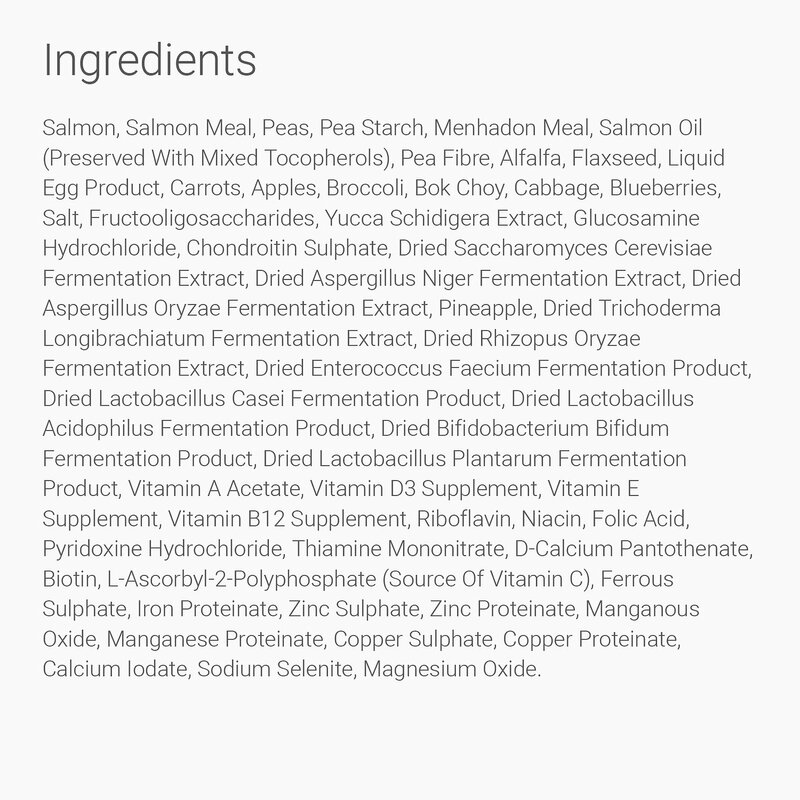 Salmon, Salmon Meal, Peas, Pea Starch, Menhadon Meal, Salmon Oil (Preserved with Mixed Tocopherols), Pea Fiber, Alfalfa, Flaxseed, Liquid Egg Product, Carrots, Apples, Broccoli, Bok Choy, Cabbage, Blueberries, Salt, Fructooligosaccharides, Yucca Schidigera Extract, Glucosamine Hydrochloride, Chondroitin Sulphate, Dried Saccharomyces Cerevisiae Fermentation Extract, Dried Aspergillus Niger Fermentation Extract, Dried Aspergillus Oryzae Fermentation Extract, Pineapple, Dried Trichoderma Longibrachiatum Fermentation Extract, Dried Rhizopus Oryzae Fermentation Extract, Dried Enterococcus Faecium Fermentation Product, Dried Lactobacillus Casei Fermentation Product, Dried Lactobacillus Acidophilus Fermentation Product, Dried Bifidobacterium Bifidum Fermentation Product, Dried Lactobacillus Plantarum Fermentation Product, Vitamin A Acetate, Vitamin D3 Supplement, Vitamin E Supplement, Vitamin B12 Supplement, Riboflavin, Niacin, Folic Acid, Pyridoxine Hydrochloride, Thiamine Mononitrate, D-Calcium Pantothenate, Biotin, L-Ascorbyl-2-Polyphosphate (Source of Vitamin C), Ferrous Sulphate, Iron Proteinate, Zinc Sulphate, Zinc Proteinate, Manganous Oxide, Manganese Proteinate, Copper Sulphate, Copper Proteinate, Calcium Iodate, Sodium Selenite, Magnesium Oxide. When switching your dog from another food, transition your food over 6 days by mixing the original food with an increasing proportion of horizon fish formula until the last day when you can stop mixing. I love this brand and the large size kibble. Perfect for my Am bulldog who has allergies. For my smaller dog I soak it in warm water. Both dogs love their kibble. So far no problems with allergies or soft stool/diarrhea. I used to feed Acana Wild Atlantic and rotate with Fromm surf and Turf. This product is still processed in Canada and much more affordable. Both of our dogs love this food. Our welsh terrier is very picky, but when I say it is time for breakfast or dinner she runs to her bowl. We have tried many dog foods and this one is a keeper. Been feeding this to my 2 herding breed mixes for three years now and they look amazing - bright-eyed, sleek-coated and bushy-tailed with small firm stools, no gas and great overall health. I switched my boyfriend's senior dachshund over to it and now he smells better, his coat is softer and he's much more active. This is the best food I've found that I can afford. Yes it's smelly -- it's salmon after all -- but it's well worth it! Very good line of food! dogs loved it! it's just too rich in protein for my large breed puppies. Tried Legacy after a lot of research and another high quality food causing digestive issues for my dog. Within 24 hours of eating Legacy he was back on track! As some others have mentioned it is pretty smelly and you will notice that on your dogs breath :p but at three weeks in, it is holding his interest and he's his happy, active self without digestive issues. Did a lot of research and found this highly rated and with great reviews. Pup eats it up, looks great, and I get peace of mind. Win for mom and furball! I researched to find this dog food. 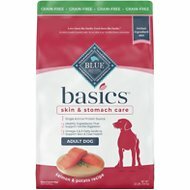 My dog had had a month of chronic diarrhea and vet could not find a reason for it and suggested trying to change her food. As soon as I changed to this, she got better and has been great since with no issues! Purchased about a month ago. My 13 yo lab is happily eating this food. After researching and looking into the best dog food out there, I decided to switch from Wellness to this. No issues with the transition.